The founder of Sustainable Health Enterprises (SHE) was recently named winner of the prize and is pioneering a new era of home-brewed NGOs. Elizabeth Scharpf of Sustainable Health Enterprises (SHE) has been announced as the winner of the annual Curry Stone Design Prize — a no-strings-attached award granting $100,000 to a designer with global social impact. 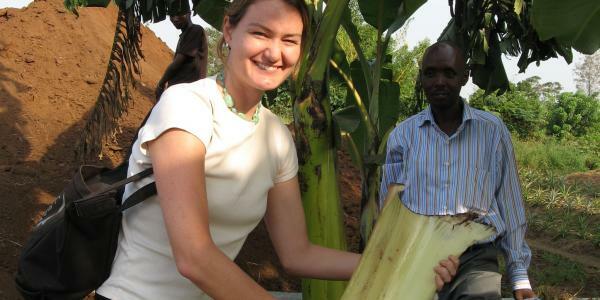 Scharpf–not a designer in a traditional sense of the word–is a Harvard MBA and Echoing Green Fellow and her award-winning social enterprise, SHE, manufactures and distributes eco-friendly banana-leaf sanitary pads to women in Rwanda. SHE works with organized networks of women to both manufacture banana leaf-based pads and sell them at 30% of the current market price of pads in Rwanda–pads that are highly taxed and made from imported ingredients from Europe. SHE thus created a locally-produced model that helps women not only earn an income from sales, but helps prevent women from losing productivity resulting from absence from school and work. Due to high costs and embarrassment from lack of pads, women and young girls often miss up to 50 days of school and work per year. Scharpf beat out two final contenders for the top prize — ELEMENTAL, a Chilean design firm that designs alternative housing structures in Chile for former shantytown residents and Maya Pedal, a non-profit that recycels bicycles to create pedal-powered technology to streamline agricultural and household tasks in developing countries. Previous winners of the award include Colombia’s Transformative Public Works (2009) and South Africa’s Urban Indigenous Architecture (2008) and advisers include Cameron Sinclair of Architecture for Humanity. So you can see why Scharpf’s win is a game-changer in the design space. Not trained in traditional design, she represents a whole new breed of designer for whom social innovation and user-centered research–which SHE relies on heavily–has become increasingly relevant. We wrote about Scharpf last month after her nomination was announced and explored the topic of what it means to be a designer today when the word has come to reflect a massive cross-disciplinary “field.” Scharpf–in her approach and in her thinking–seems to reflect the types that graduate from MIT and RISD and walk the halls of IDEO. Her award in a design category further cements the expanding landscape of design. The Curry Stone Design Prize was started by architect Clifford Curry and his wife, H. Delight Stone, to award designers of innovations that make considerable impact in the fields of education, food, water, health, energy, peace promotion, and social justice.